When translating some of the entries to English language we have found some issues regarding some food and dishes names. We are going to use this section of the blog as a "glossary" of those Spanish terms that we feel challenging to translate or we just simply don't want to do it but instead share with you a bit of knowledge on Spanish cuisine and culture. Camino de Santiago: or The Way of St. James is the pilgrimate route to the Cathedral of Santiago de Compostela in Galicia, where tradition has it that the remains of the apostle Saint James are buried. The most popular route is the Camino Francés which stretches 780 kms from St. Jean Pied du Port near Biarritz in France to Santiago. Cuajada: It's a product obtained from sheep's milk and natural curd. It's very popular in the north-eastern regions of Spain (Basque Country, Navarra, Castilla y León and La Rioja) It's usually served as a dessert with honey and walnuts and sometimes sugar. Cuajada is the Spanish name for "curdled". It's usually presented in small earthenware. Cojonudos: Cojonudos which means "freaking good" is the way the famous and delicious asparagus from Navarra are internationally known. It refers to the white, thick, long and soft texture asparagus grown in Navarra under very special conditions. 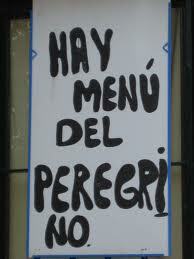 Menu Peregrino: Pilgrim Menu is offered in most places along the Camino. Usually it's a three course set menu. Normally a soup or a salad as a starter. Fish, chicken or other meat with chips as a main course. Finally, a dessert such as ice-cream, a piece of fruit or any other pudding normally a homemade one. Bread and a bottle of wine or water are always included. It's basic and traditional food perfect after a hard day walking or cycling the Camino. It usually costs less than 10€. 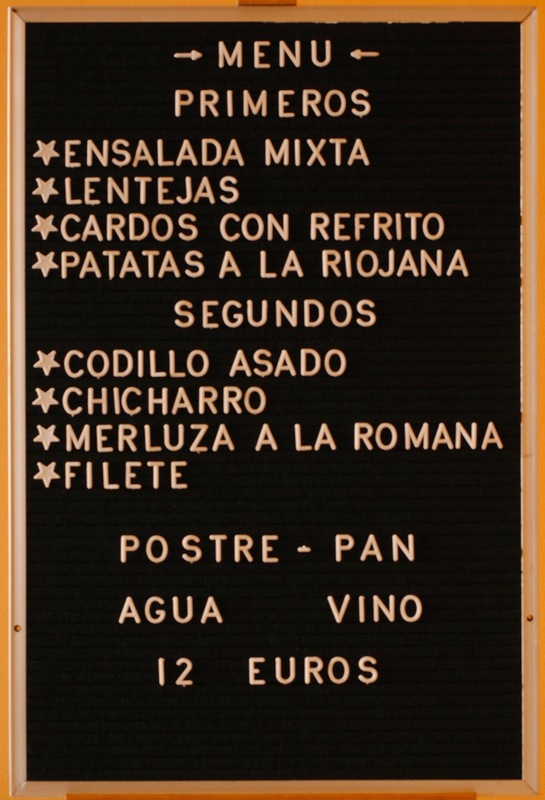 Menu del Día: It's similar to the Menu del Peregrino but you can often have several options to choose for. At least 3 starters and 3 main are offered for you to choose one. Water, wine, bread and a dessert are also included in the set price. If you don't drink wine you can have a soft drink instead. Prices could vary from 8€ to 20€ or more. Bicigrinos: It's a compound word made of bici (bike) and peregrino (pilgrim) It refers to the pilgrims that cycle the Camino. The term was created by the owner of Bicigrino, the blog which offers all the information you need to know about cycling the Camino. Caña: Normally a 25cl of cold and fresh beer (draught lager) served in a glass with a cylindrical shape. To avoid misunderstanding you should refer to it as "una caña por favor". Clara de limón: It's like a caña but with some Lemon Fanta or Lemon KAS to make it more refreshing. 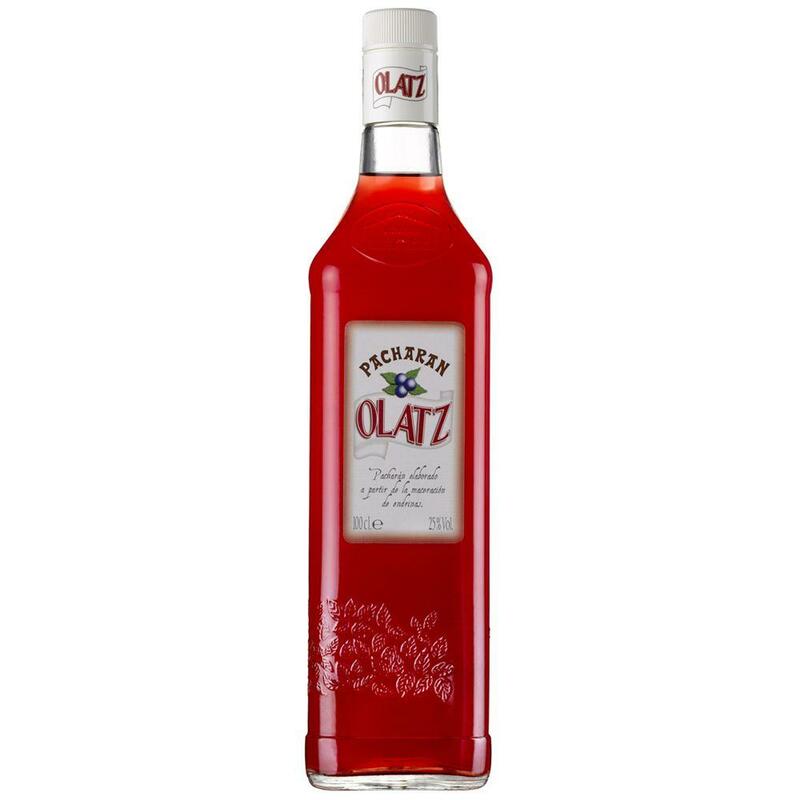 Pacharán: A liquor typical from Navarra made with sloes and a base of anisette. Rabas de calamar: Calamari Rings o pieces of calamari normally breaded and fried. 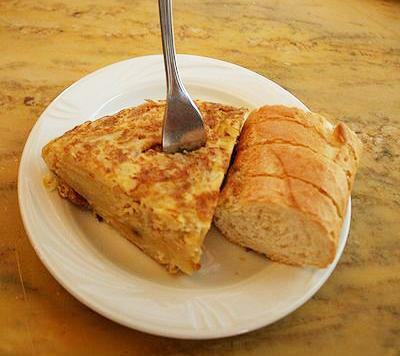 Pincho de Tortilla: A piece of tortilla (Spanish Omelette) normally served with a piece of bread. It's perfect for the afternoon break. 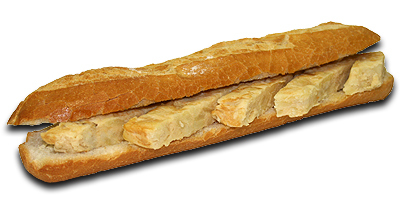 Bocadillo: A piece of bread (baguette style) sliced in half and filled with a big variety of ingredients. The most popular are chorizo, jamón (serrano ham), queso (cheese) but they can also be filling with hot stuff as tortilla (omelette), lomo (pork loin), ternera (beef), bacon or even calamari rings. The can also have slices of tomato or just a tomato rubbed on the bread to moisten it. You can have them in most bars and also order them for take away. They'll wrap them in foil so you can eat them at your convenience. They are a cheap alternative to the menú del día but as delicious as any other Spanish meal. A typical snack of the Basque Country and North areas of Spain such Navarra and La Rioja. They are made up of a small piece of bread upon which an ingredient or a mix of them is placed and fastened with a toothpick. They are usually eaten as an appetizer both at lunch and dinner time. The toothpick is used to keep the ingredients from falling off the bread but also to keep track of the number of items that have been eaten. So, please never through the toothpick to the floor. This is a very simple and basic dish that could be found in most Spanish bars. The literal translation is broken eggs and it comes because yolks of the eggs are broken with a knife before being eaten. Huevos Rotos are egg fried served over homemade chips fried in olive oil and tossed with salt. They can be then combined with many ingredients. The most popular are serrano ham, chorizo, lomo (pork loin), morcilla or fried green peppers. They are delicious at anytime of the day. It's a stew made with beef trip (callos). It's perfect for warm you up in winter day. There are lots of recipes to prepared them and frequently they are served with chick peas. In some places they are served as a tapa on Sundays. Anónimo 17/9/13 5:04 p. m.
Thanks for this Information. I am an german Bicigrino on my way to Santiago. Today in Fromista. Bye..